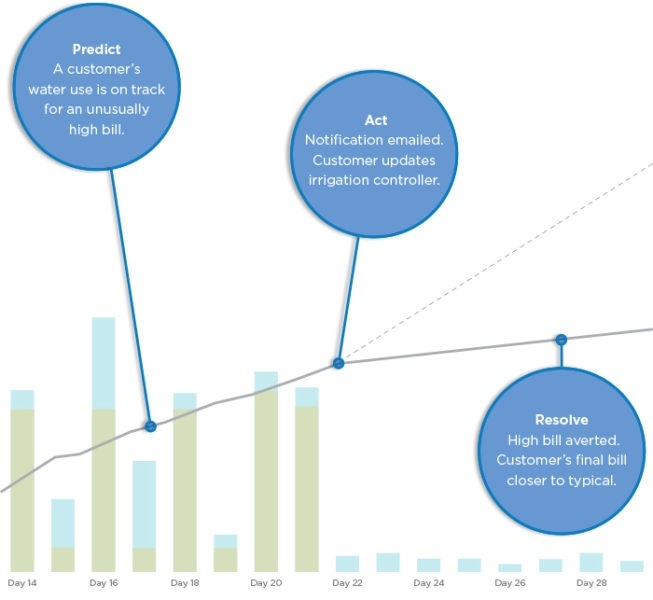 How much time do customers spend thinking about their water utility? According to consulting company Accenture’s consumer survey, if they are anything like the average customer, it’s around 8 minutes a year. Most people just don’t spend that much time thinking about their water. How, then, can water utilities break through with a message that their customers will receive? By taking a page out of the marketer’s playbook and focusing on the customer journey, water utilities can maximize their interactions with their customers. Years ago, smart marketers had the insight that marketing had become too disruptive to consumers. Consumers were being bombarded with message after message without regard to who they were or what stage of the buyer’s journey they were in. As a result, consumers tuned out these messages and the marketing was not impactful. Smart marketers began thinking harder about the messages they were putting out to consumers. They realized that the timing of a message could be just as important, if not more so, than the content of the message itself. They began paying attention to the most impactful moments in a consumer’s relationship with the products and services they buy, and centering messages around those moments. In marketing, this is called customer journey mapping. At WaterSmart, we call these moments Watershed Moments. 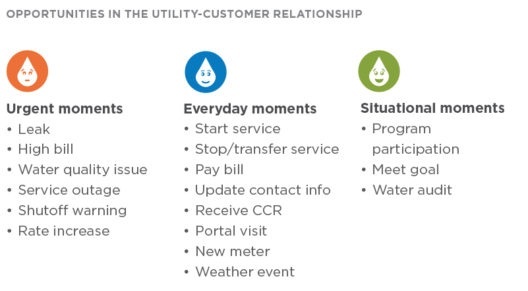 Instead of engaging with their customers in a meaningless, context-free way that interrupts and annoys, utilities can use the Watershed Moments framework to target the right customers with the right message at the right time. 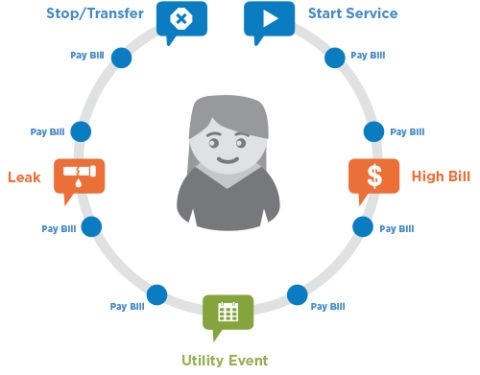 For example, the moment every month when a customer pays their bill is the perfect time to engage them about signing up for paperless billing. When a customer has a leak, it’s the perfect time to engage them about signing up for leak alerting or a rebate offer while their water usage is top-of-mind. Watershed Moments can be characterized into urgent moments that are time-sensitive; everyday moments that require competence; and situational moments that depend on the customer taking a particular action. Urgent moments include having a leak, receiving a high bill, water quality issues, outages, and more. These are moments to build trust with customers, who are already going through an unpleasant experience. Everyday moments include starting and stopping service, paying bills, updating customer information, and more. These moments make up the majority of a customer’s utility experience so demonstrating competence here is key to improving customer satisfaction. Situational moments include participating in a utility program or meeting a water use goal. These are opportunities to delight customers by elevating their self-service experience. In the following example, a customer was on track for a particularly high bill because of their unusually high water use. WaterSmart found that their usage pattern was consistent with a broken irrigation controller. They received an automated high bill forecast warning them that they were on track for a high bill and that it was likely due to their irrigation controller. The customer received this notification in time, updated their irrigation controller, and averted a high bill. Not only was the utility able to avoid an angry phone call, but they were also able to delight and exceed this customer’s expectations. How can utilities put Watershed Moments into action? By following this simple framework.